Happy Tuesday everyone! We are excited to reveal our Westchester Project. Like many of our clients, this is a young family that loves all things vintage, eclectic and most importantly they are not afraid of color. When we first met our clients, they loved where they lived and instead of moving, they decide to start renovating their home, room by room. 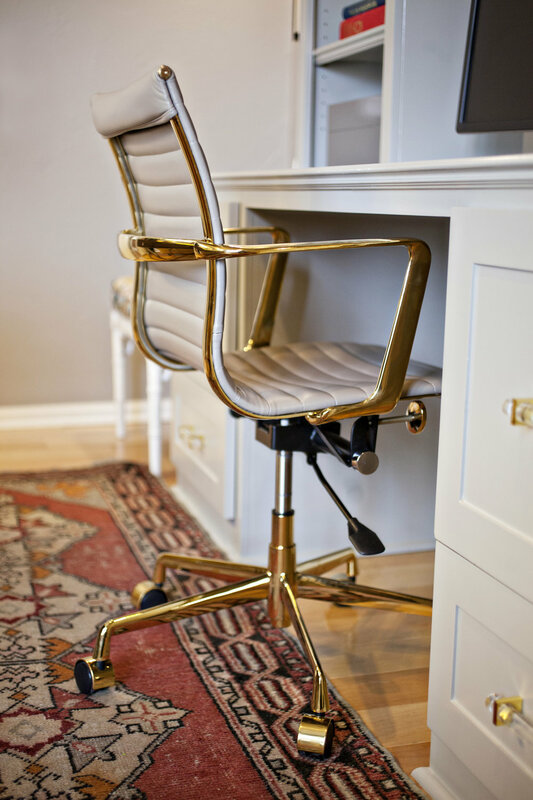 One of the biggest priorities for both of our clients was to get a space where they could work in. Since both of them work from home, they didn't have a defined space in their home to work from. One of them was literally working from their night stand (true story). They also had a lot of wants and needs for their home. In addition to the study, they wanted a space where they could entertain. 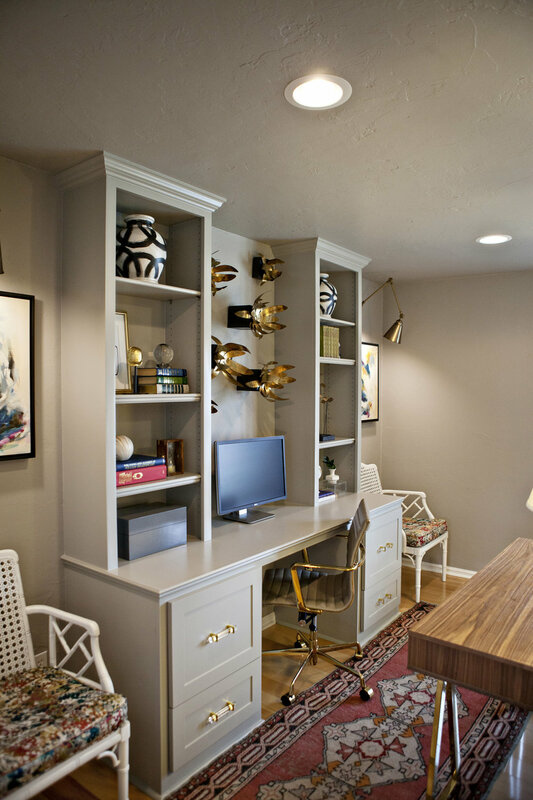 They had a large formal dining room that was barely being used, to make better use of the space, we decided to turn it into their study and formal living room. We are really bad at taking before pictures, so here are the few we did take. One of the main issues we have with older homes, is they can have multiple entrances to each room. This is great for the flow of the home, however, from a design perspective it sometimes can get in the way with the purpose of a space. Their dining room had an oversize opening into their entry and a smaller entry into their breakfast nook. In order to make better use of the space, we decide to close in the entry opening and use that space to formulate the formal living room. They had an amazing buffet that we wanted to re-use in the space, by closing the entry opening, we can use that as a base for the TV. 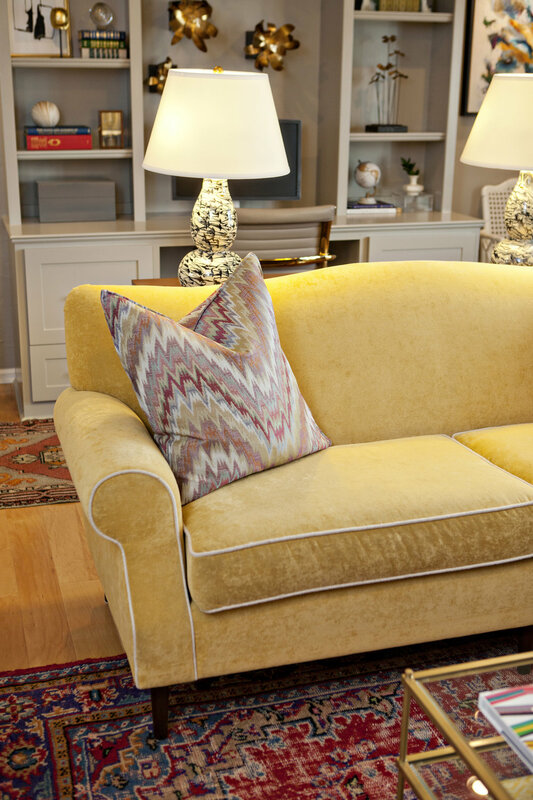 Our clients had an amazing yellow velvet couch, that we tweaked a little to update it and bring it into the space. The couch brings great color to the space and adds to the warmth. 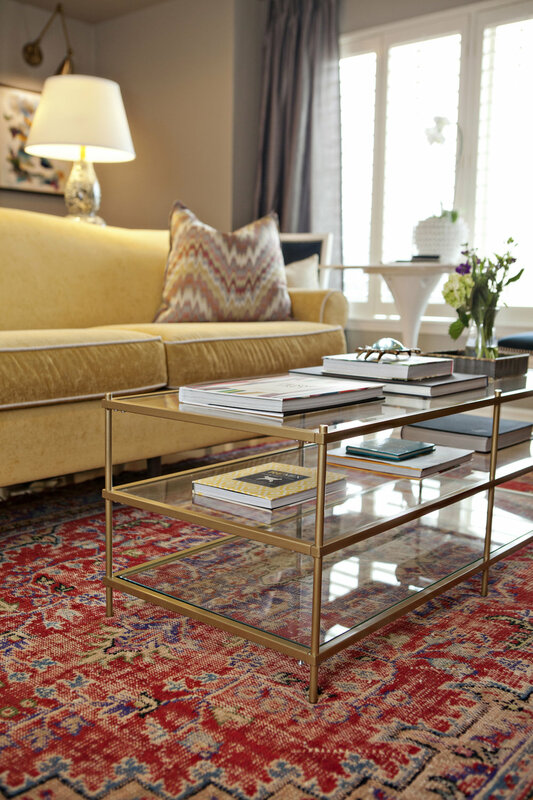 We anchored the space with a gorgeous vintage rug and a gold and glass coffee table. In the corner we wanted something fun for our clients, so we placed a lucite bar cart, they can enjoy after their kiddos go to bed ;). 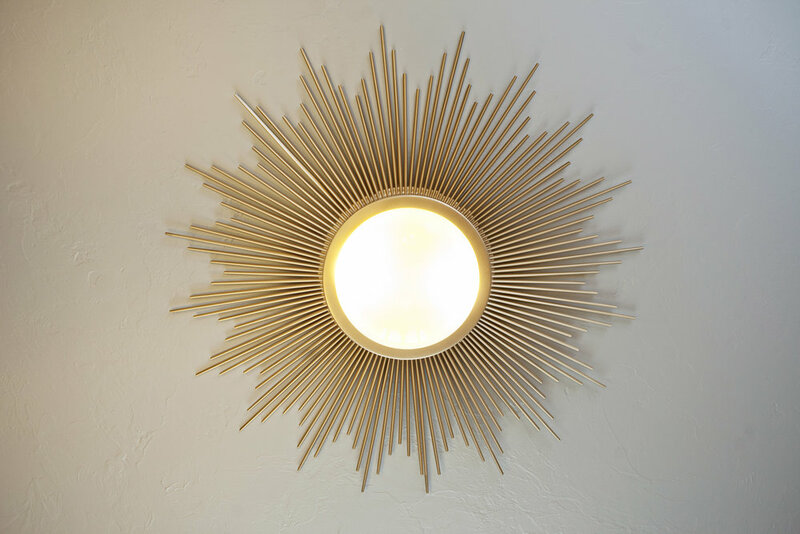 Lastly, we wanted a really fun light fixture, and this light fixture does not fall short of fun and beautiful. 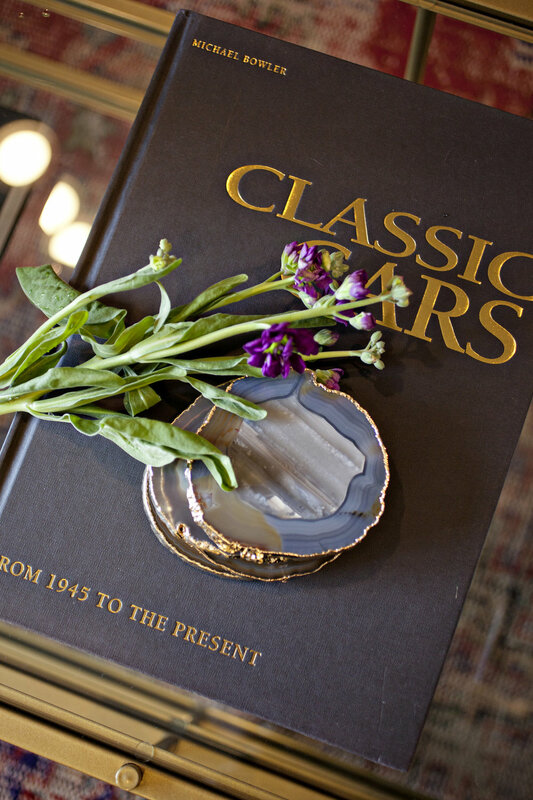 I have to mention that the beautiful agate coasters we used for this shoot are from Blanc. Our dear friend Anna started this company not too long ago, and she has beautiful items for the home and gorgeous jewelry. We love supporting our friends, but also women and local businesses! For the study part of the room, we decided a built in would be the best use of the space, with a writing table set behind the couch. We added doors to the breakfast nook entry, so they could have privacy during working hours. We added color with the artwork and various accessories in the built in. 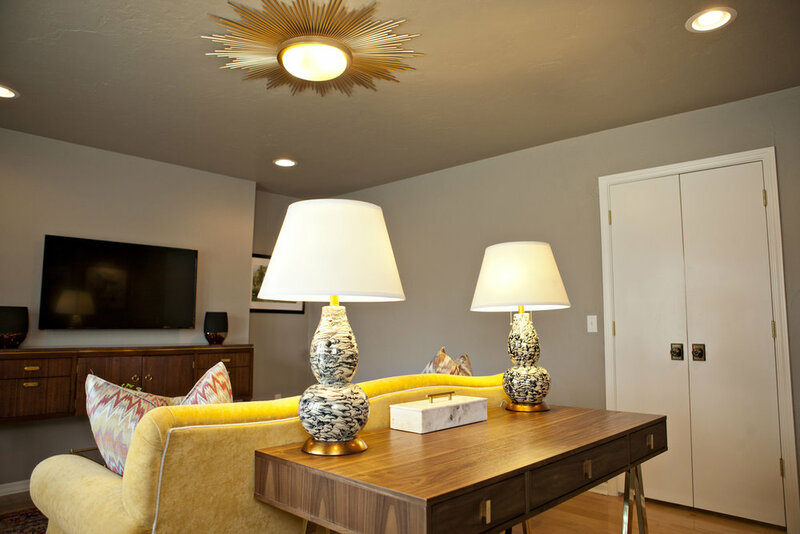 I love the lamps we found, they add an eclectic flare to the room. 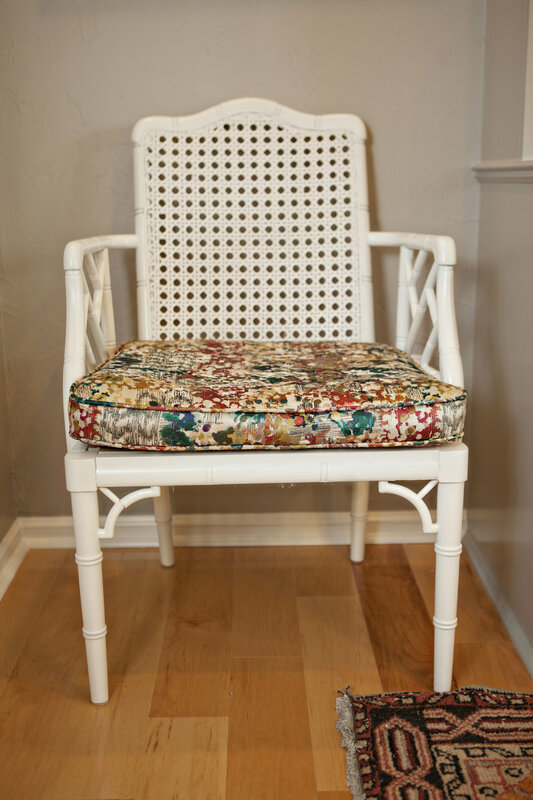 Our client found some amazing chairs that we had painted in a glossy white and we re-upholstered the cushions in a colorful fabric. My favorite part of the room is the additional seating area by the large window. Our clients mentioned they love to play games, so we felt this would be a good place to sit down after a long day and enjoy a card game or two. 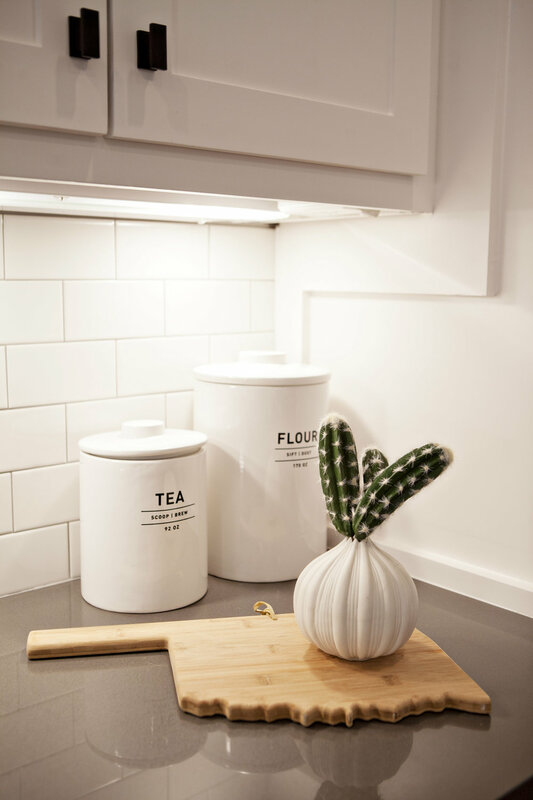 We hope you love this multi-functional space as much as we do. We are working hard on other projects and can't wait to share them with you! Thanks for reading and have a great rest of the week! Happy Monday! This is the first Monday in awhile, that I felt on routine. The last month has just felt like a constant vacation, barely knowing what day of the week it was. We are so excited to reveal our Downsview Project dining room. We completed this dining room just before Thanksgiving, just in time for the holidays. Much like our Beaupre project, this home has a lot of french country design, that our clients wanted to move away from and into a more transitional design. The dining room has sprawling ceilings with a large window that creates a gorgeous focal point, not only in the dining room, but also when you walk into the front doors. 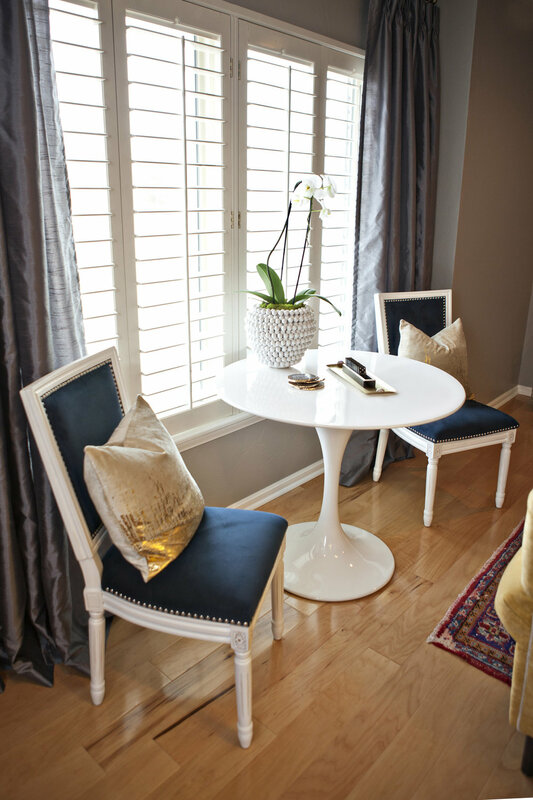 We really wanted to set the tone for the home by creating an elegant space that fit the overall esthetic of the home. The color palette contains neutral white tones that compliment the deep gray of the dining end chairs, the gold chandelier and the pink oriental rug. Our client's had a hutch in their dining room they wanted to reuse, the color was a deep brown, that we had repainted in a glossy white. Instead of doing a large piece of art, we were inspired by the wallpaper panels we keep seeing. We found some art panels that reflect the same chinoiserie wallpaper, but instead this art is made out of wood. 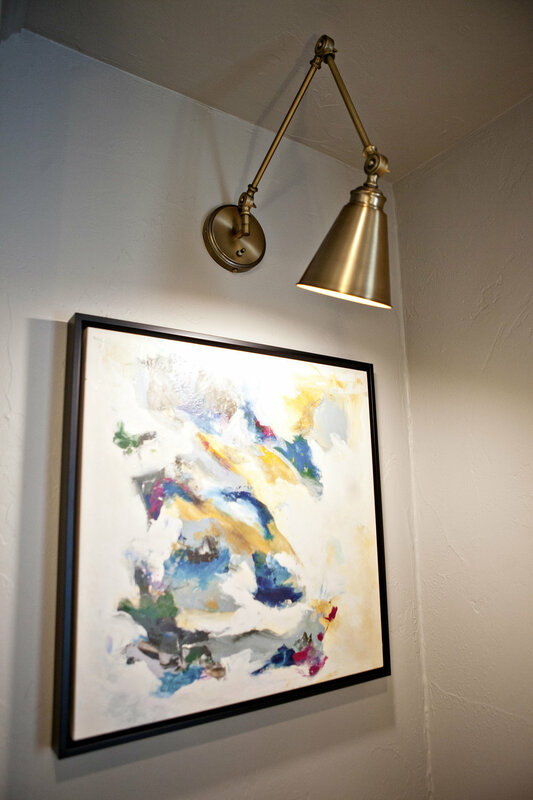 We placed gold sconces on either side, so the panels were not overwhelmed by the amount of wall space. 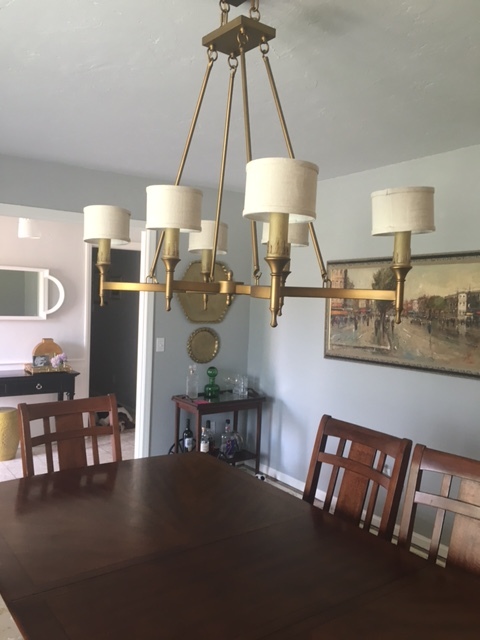 My favorite part of the dining room is the gorgeous chandelier. Previously, there was an iron chandelier that was way too small for the space. With the massive height of the ceilings, we knew we needed something that was going to produce a wow factor. 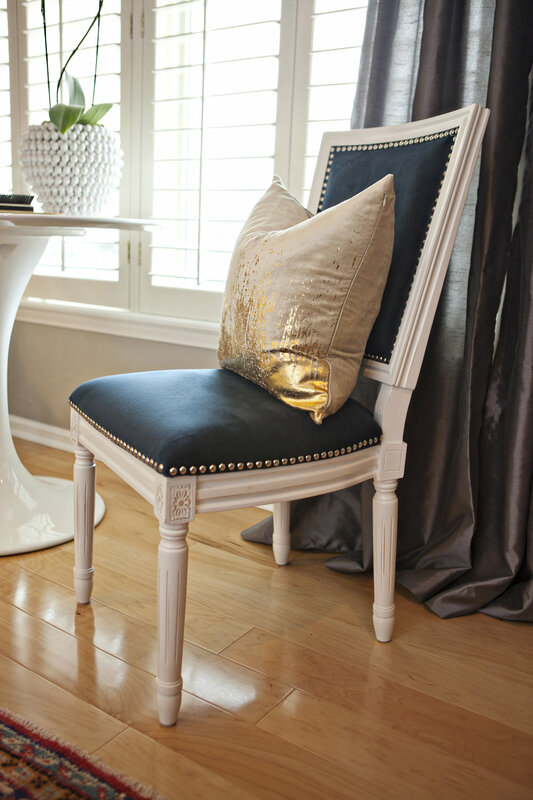 The chandelier provides the right amount of elegance with the draped beads, without overdoing it. Side Note: I got a few gray hairs watching this chandelier get installed. The ceilings were so tall, the electrician had to stack multiple ladders to reach the top. I was closing my eyes, praying to the design Gods that these guys would not fall off the ladder. Our clients also wanted to get some great end chairs for their dining room table. We agreed, this would help break up the current chairs, but also provide additional color into the space. The chairs are perfect for this space. The gray color of the chair blends beautifully with the colors of the space and the detailed design of the chair completes this elegant room. 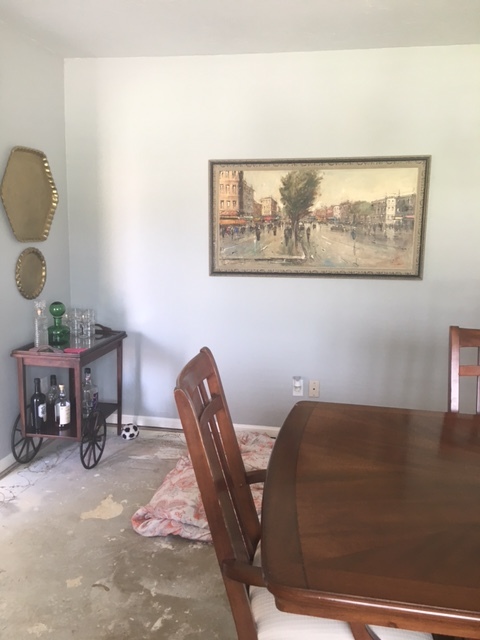 We are so happy with the way this dining room came out! We can't wait to share some of our other projects with you! We are excited to reveal our latest project. 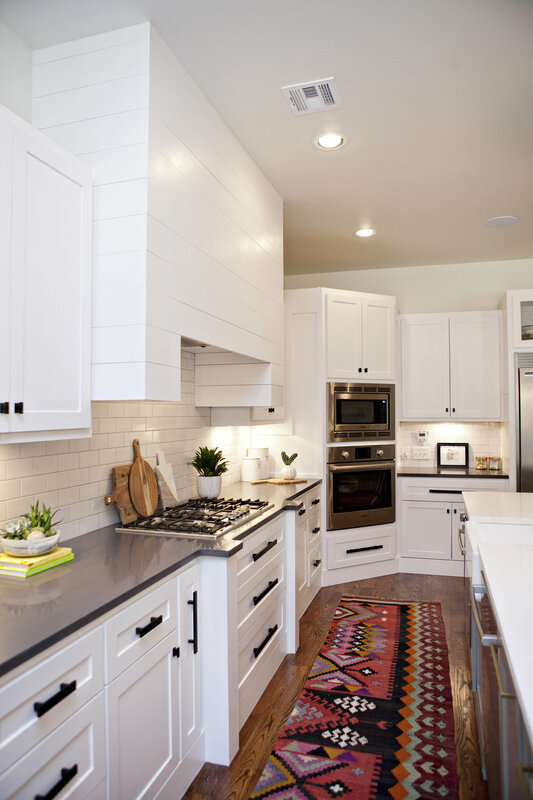 When we met these clients, they were in a midst of a home renovation and wanted our help to put the spaces together. Our client wanted a boho style, but not all the way hippy (if you know what I mean). We were happy to take on the challenge of creating a look that both met the boho look, but keeping it sophisticated. Much like our previous homes, the living space opens into the kitchen area and breakfast nook, creating an open floor plan. Our clients wanted to keep most of their existing living furniture. They had good bones and it was something that we could definitely work with. The couches are gray in color with more transitional lines and the two chairs are in a bold blue leather, that coordinate really well together. The cowhide rug really plays off the more western elements in the room, but I love how it balances the two couches. 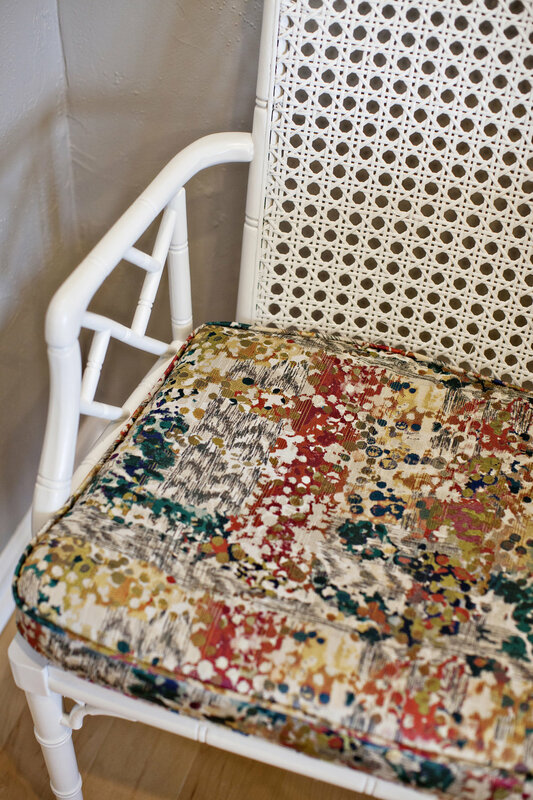 We incorporated boho chic throw pillows for the couches and chairs. 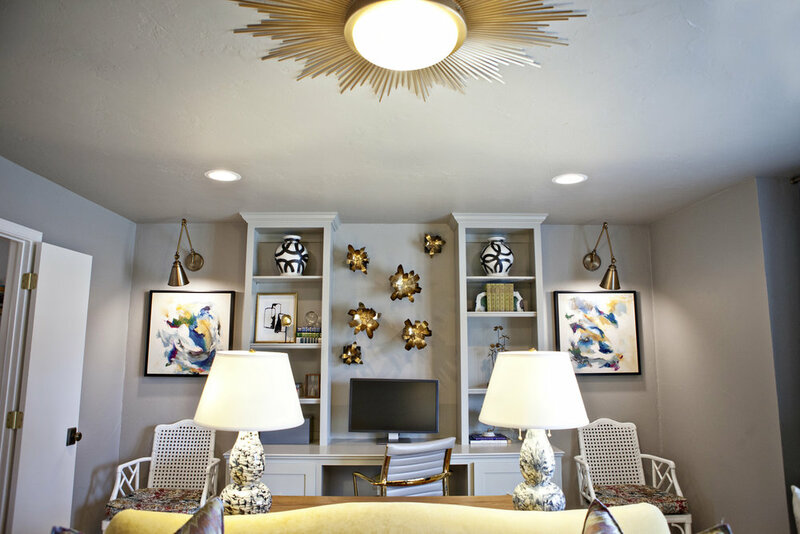 The paintings on the wall and in the built in, add pops of color. Succulents and palm leaves were placed throughout the space to add an organic element. Overall, the space came together really well, mixing in natural components with bold patterns and colors, created this boho chic living space. Stay tune for more reveals next week. Happy Halloween to all those little goblins and super moms & dads out there. PS: I really have to give a shout out to Jana Machado. She has an amazing etsy store with high end pillows at amazing prices. She sewed up our pillows within a day and they were delivered just in time for the install. She didn't have to work so hard for our very last minute order, but I am so glad she did because her pillows look amazing in the space! Check out her etsy site for great pillows: Jana Machado Interiors. Wow. How is it already October? Time is seriously flying by! Sorry for the lack of blog posts, Kellie and I have been so busy with all of our projects. We are so excited to reveal our latest project, you can see the sneak peek here. 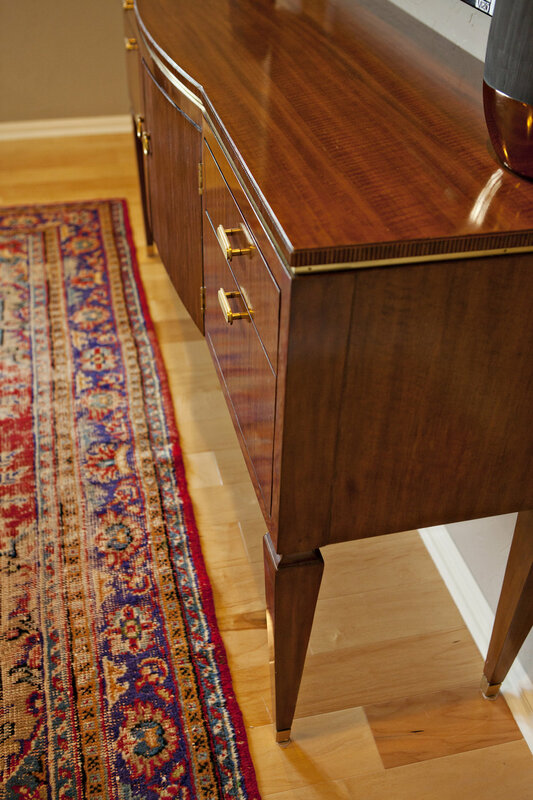 As we are doing the finishing touches on our projects, there has been one common denominator with each project: Vintage Rugs. 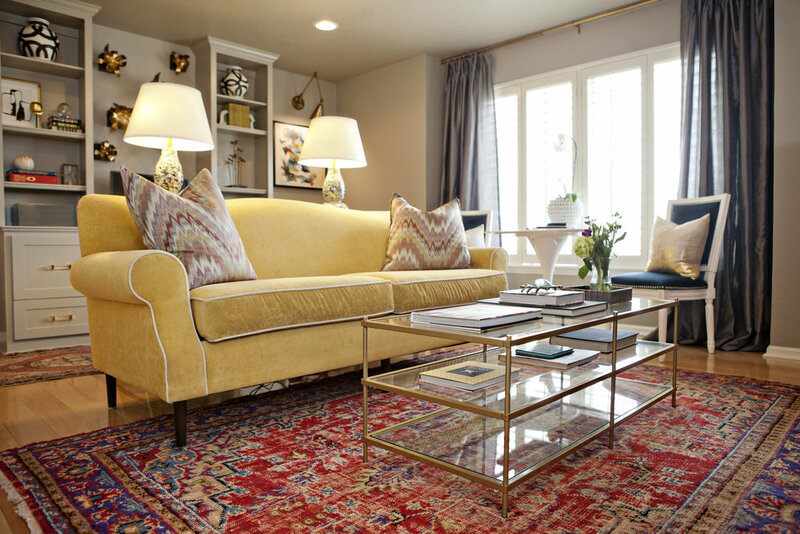 Vintage rugs has gained such a popularity in the design world and we equally love the effect it has on a space. I love the intricacy of the designs, the bright and bold colors and the story behind each rug. Even our clients, whom some of them were against bold colors, end up falling in love with how these rugs can create such a bold statement in their space. Authentic vintage rugs are not mass produced, so you have to put effort into finding the perfect one. Some of our favorite places to look is: eSaleRugs, Charish, oldvinshop, Kaya Kilim. The other options would be to search eBay, Craigslist, estate sales (a good place to find vintage rugs) or your local antique stores. If you are on a budget, you can also search Overstock or Wayfair. The only negative about buying online is you are taking a gamble on what you see online vs what actually ships to you, the overall look can vary. The other part is, the sizes also vary greatly, which means that coming across the perfect rug in the perfect size is not an easy task. 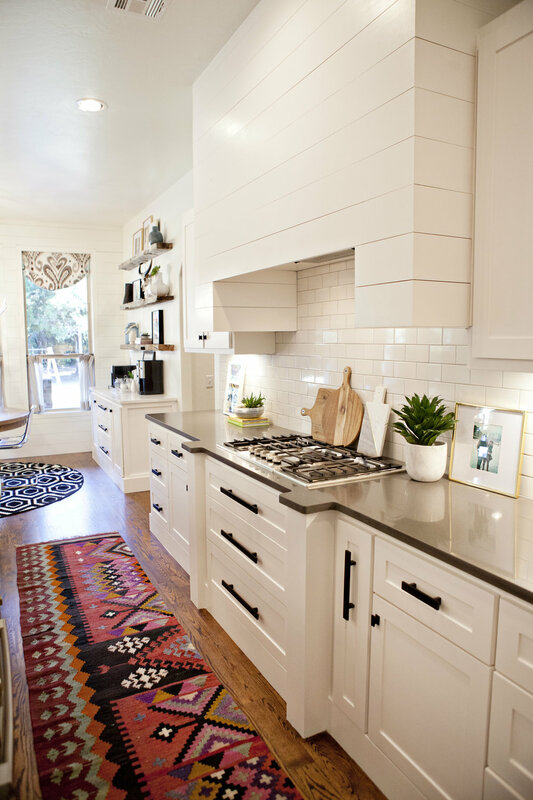 However, when you find the perfect rug in the perfect size, it really is a rewarding experience to see it in the space. We always recommend wool rugs, since machine made rugs can break down in a short amount of time. Although wool rugs can be more expensive, there are a lot of positives about them. Wool rugs are a natural noise reducer. If you have babies and wood floors, you know everything echos. Wool rugs can help reduce the noise inside and outside of the home...don't thank me now, thank me when your babies are not woken up by the slight foot steps of you sneaking out of their room at night (or army crawling, if you are me). They also last a long time...50+ years (machine made rugs last 3-5 years). The best part about wool rugs are: they are really easy to clean, hard to stain and wool rugs repeal water. Have I convinced you yet? Personally, we have had several rugs passed down from both my husband and I's grandparents and they are in perfect condition. If you want the perfect statement piece, that unfolds the story of your home, I would definitely suggest investing in a good vintage rug.